Thanks Christian, every days a school day, roughly what age do they reach maximum body weight. Last year I saw a cracking stag in a neighbouring field, proper 'monarch of the Glen'. I dont have permission there and anyhow he'd seen me first, I would'nt have taken him, he was too good. The look he gave me was priceless, f##* o##! There's at least 5 red deer in residence on my patch including a hind with follower so back again tomorrow. I can't give you a definitive answer to your question Moorman. There's too many factors that play a part in a Deers physical condition. But what I will say is that there at peak weight approximately September time. Those other 5 will stay in that proximity (If left undisturbed) until the back part of the summer. Then they'll move off in search of hinds for the rut. Hopefully returning back with others onto your ground approximately November/December time. Thanks, interesting, I try not to overstalk the area as the roe get even more elusive and dont want to move the reds away. 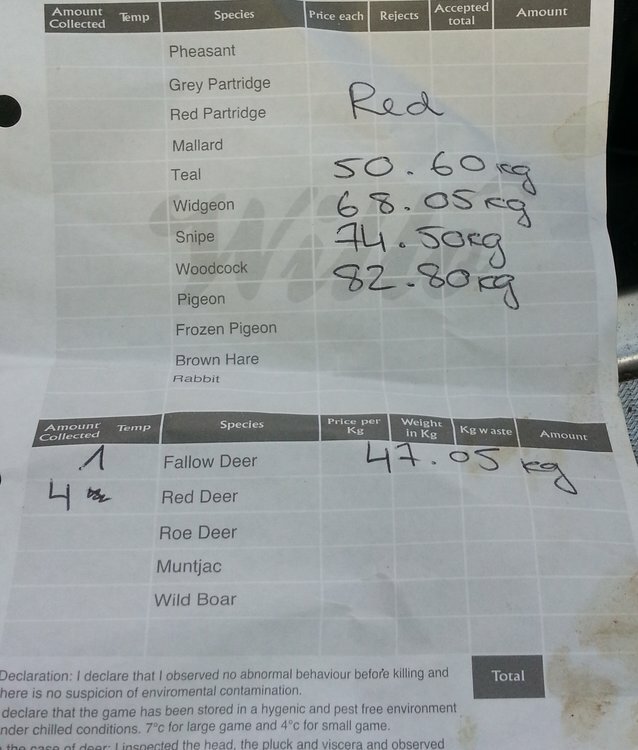 Larder weight (head, legs off +clean) was approx 70kg, haunch;11kg each, loin; 2.4kg each. As it was my first butchered it myself. Game dealer prices down here are £2.50/kg. I have found trail cameras invaluable for recon. I find they make for more positive stalking even when you blank. Do you use salt licks or food to hold deer? I have in past dumped windfall apples in wood but had no cameras then so result was unknown. Don't want to spook them unnecessarily. That sounds about right (70kg) for the age and time of year.. Over the years ive seen some very over exaggerated guesstimates from the self proclaimed semi pro`s believe me. Staggies in there second year like yours vary quite a lot in larder weight, anything from and between 60kg-87kg. Don't see any point in exaggeration really, only cheating yourself and its easy to look a fool. You can see why people poach deer.